It takes years of training and hard work for an athlete to make it at an event like the World Para Athletics Championships, taking place in London now – and a talented team working behind the scenes to help them on their journey. 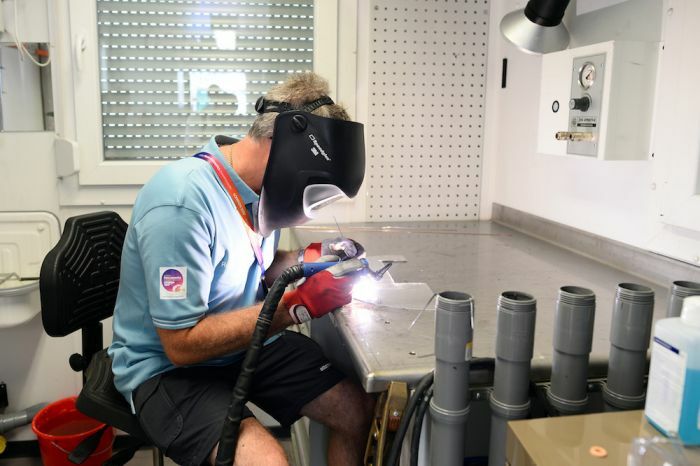 At the Queen Elizabeth Olympic Park right now, there’s a team of 22 men and women working to help the athletes be at the top of their game for the competition – making repairs and adjustments to the kit that helps them compete in a range of different events. Russell Pizzey is the technical services manager working with Otto Bock, one of the leading suppliers of wheelchairs, prosthetics and orthotic devices at the Championships. Russell and the team have worked with over 340 athletes so far at the park, working to make sure their equipment is ready for the competition of the year. 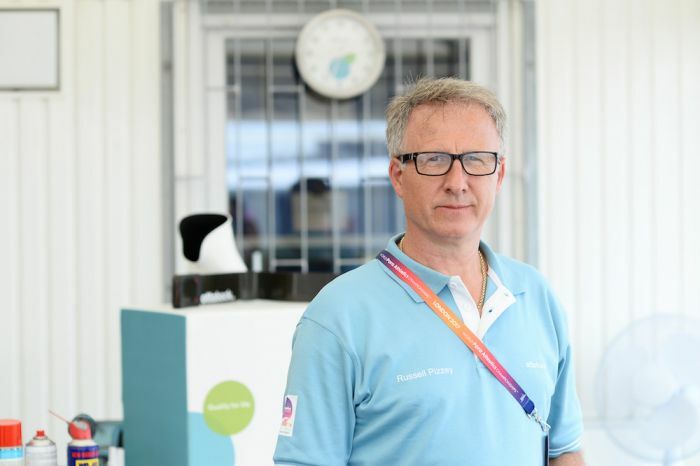 Russell has worked with the company at events including the 2012 London Paralympic Games and the Sochi Paralympic Winter Games in 2014 plus both the Invictus Games in London and Orlando, and this is his third World Para Athletics. Here, he tells us what life is like in the ‘pit lane’ for para-athletes. 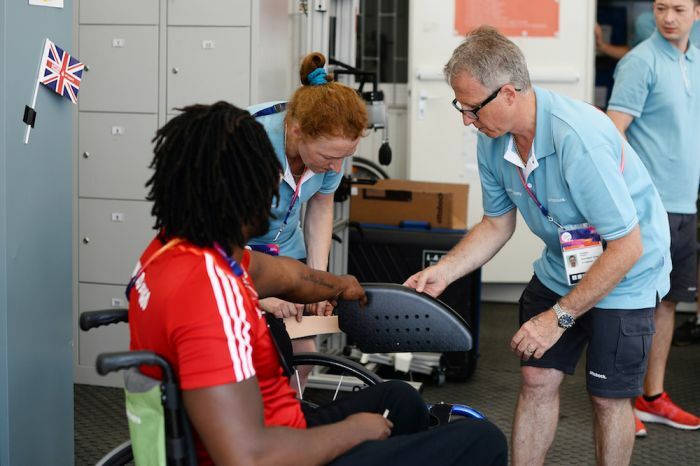 How would you sum up what it is you do behind the scenes at an event like the World Para Athletics Championships? We look after all the athletes and training staff. We maintain all of their equipment – the reason I say equipment is because that can be wheelchairs, prosthetics, orthotics. It can also be their throwing chairs, for shot put. We also take care of the any aids they may use. If you look at the 100m and they’ve got an arm deficiency, they might use starting blocks. We carry out all the repairs to those. We might also make items for them. A lot of them will see a competitor and then come to us and say, ‘Can you do something similar?’ Then we go off and make something for us. So you’re kind of like the pit lane in Formula 1? That’s it! Time is the essence for them. A couple of days ago, for instance, we had an athlete who had a big crash in one of the sports chairs, he had an accident in the warm-up in the evening, and the following day he had the actual event. We had to repair them there and then, that evening. Pressure’s on for both sides – not just for us, but for them. It starts off calm. As the teams come in to pick their equipment up, it gets busier. The wheelchair is the most repaired item, followed by a throwing chair. Throughout that day, you’ll get welding jobs coming in. At the moment we’re making a complete knee orthosis and ankle orthosis which is for an athlete. We tend to make things after their event. If they come to us before the event, they don’t have time to get used to it. It’s not good for them. It could do more harm than good. What kind of repairs and adjustments are you doing day-to-day? We do a high number of replacement of wheels and inner tubes. We do a lot of adjustments to brakes of wheelchairs. It may be that during transport the breaks have shifted or moved. So we do complete set up. We do welds to the frame on wheelchairs. And we replace carbon fibre running blades – they’re not repairable. We’ve got two blades that we’ve replaced this week. Are there any guidelines that you have to adhere to in competitions like this? For the World Para Games there isn’t so much, but if we were going to do rugby wheelchairs, there is strict guidance for the front bumper – they have a nudge bar at the front. That has to be certain dimensions, a certain height from the ground and a certain distance so if we do any adjustments in rugby, it has to comply with the regulations. You’ve done lots of major events like this. What’s the atmosphere like? It’s a privilege for us. We thrive on engaging with all the athletes. How closely do you work with the athletes? We try and engage with them before they need our services – so it’s a bit easier for them to talk to us. Otherwise, when they first come up to us and they have problems, it can be difficult because they’re anxious and they’re very focused. Trying to get to what they actually need to secure their requirements is sometimes challenging. Bearing in mind all the different languages as well. We always have French, German, English – whatever country we’re working from, there will be core people from those areas. When the athlete comes back with a medal. If they’ve come into the workshop during the warm-up races, and they’ve used our services, we then ask them that if they manage to achieve a medal to come back and see us. We’ll post that on our website. That’s the most rewarding part. Is there quite a lot of pressure in the role? There is. When we engage with the athlete we have to find out when they need the equipment, when it’s their time slot. If they’re on the 100m straight, at the Paralympics, we were doing repairs at the 100m start. The pressure is on all sides – not just our side, but the athlete sitting in the chair having the repair done while the countdown is on. But it’s good pressure. Be the first to comment on "Behind the scenes at the World Para Athletics Games with Otto Bock"